‘This life is nomadic, cold, transient, disordered. We are getting used to just hoping for the best. That wheezing accordion underscores the general emptiness. The cold click of a rifle bolt. Wind outside the window. Dreams and drifting snow.’ This is from the diary of Ivan Chistyakov, a cultivated Muscovite who was conscripted into Stalin’s army of internal troops and sent to guard forced labourers in the remote far eastern region of the Soviet Union. The diary has been translated by Arch Tait and is just published in the UK by Granta as The Diary of a Gulag Prison Guard. Very little is known about Chistyakov. It is likely he was born at the very beginning of the 20th century. He lived in Moscow, not far from Sadovo-Kudrinkskaya Square on the inner ring road, and probably had some secondary education, may even have been an engineer. He took the tram to work, went to the theatre, played sport and enjoyed sketching - all details drawn from his later diary. During one of the extensive purges, he was expelled from the Communist Party in the late 1920s or early 1930s. In 1935, Chistyakov was conscripted into the army, the internal troops, and sent to a so-called Gulag camp - Baikal-Amur Corrective Labour Camp or BAMLag - in the remote region around Svobodny, very roughly 5,000km east of Moscow and a 1,000 km north of Vladivostok. There he was given command of an armed guard platoon on a section of the Baikal-Amur Mainline (BAM) railway being built with forced labour under the direction of GULag, the State Directorate of Camps of the NKVD (secret police). His platoon was charged with guarding the prisoners (zeks) on their way to work, patrolling the camp perimeter, and catching anyone trying to escape. The prisoners built the railway in unbelievably severe geographical and climate conditions, in extremes of cold and rainstorms, laying track through untamed land, mountains, rivers, swamps, permafrost. Life was little better for the guards; and for Chistyakov it was a daily nightmare, the severe cold, the lack of a bathhouse, illness, terrible food. Early on, he confided in his diary that he was thinking of committing a minor offence to get himself a conviction. There is very little further information as to what actually happened to him. In 1937 he was arrested, only to be released the following year, and to meet his death during the first months of the war with Germany, in 1941, at the front in Tula Province. According to Elkost, the international literary agency, ‘it is a miracle that Chistyakov’s diary somehow survived, that it did not fall into the hands of NKVD officials, that it was not discarded and destroyed, and that somebody managed to send it to Moscow.’ Since 1988, the diary has been held by the Memorial International Human Rights Centre in Moscow which collects documents, testimony, memoirs, and letters relevant to the history of political repression in the USSR. Elkost calls the diary a ‘unique historical testimony’ since there are few memoirs ‘written by people outside the barbed wire’. Elkost says it has sold the rights to publish the diary in more than half a dozen countries, as well as to Granta in the UK for worldwide English distribution. 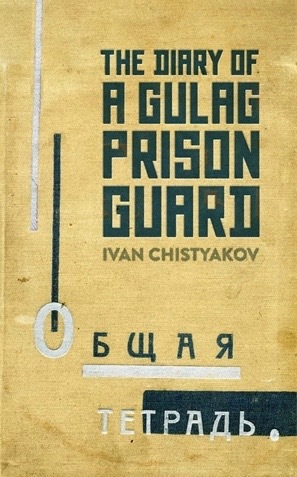 Indeed, Granta has just published The Diary of a Gulag Prison Guard in the UK, as translated by Arch Tait, with an introduction by Irina Shcherbakova. The book can be previewed at Googlebooks or Amazon. ‘The frost is really setting in. Minus 18. I’ve put on my felt boots, a very good invention. We go through another one of our farces, searching the zeks for knives etc. They are so indignant. People need to be able to slice bread, peel potatoes, chop firewood, don’t they? If they had any serious weapons, they certainly wouldn’t store them in the huts. Budnikova (Article 35) rightly protests, and very forcefully. I would have done the same. ‘This life is nomadic, cold, transient, disordered. We are getting used to just hoping for the best. That wheezing accordion underscores the general emptiness. The cold click of a rifle bolt. Wind outside the window. Dreams and drifting snow. Accordion wailing, feet beating time. There’s heat from the stove, but as soon as it warms up one side, the other gets cold. A fleeting thought: am I really going to have to put up with this for long? Is life just one perpetual shambles? Why? I want to let everything go hang and just float downstream, but I’d probably get banged up myself. Come on, head, think of something and I’ll buy you a cap! ‘This is how we live: in a cramped room furnished with a trestle bed and straw mattress, a regulation issue blanket, a table with only three out of four legs and a creaky stool with nails you have to hammer back in every day with a brick. A paraffin lamp with a broken glass chimney and lampshade made of newspaper. A shelf made from a plank covered with newspaper. Walls partly bare, partly papered with cement sacks. Sand trickles down from the ceiling and there are chinks in the window frames, door, and gaps in the walls. There’s a wood-burning stove, which, while lit, keeps one side of you warm. The side facing towards the stove is like the South Pole, the side facing away from it is like the North Pole. The amount of wood we burn would make a normal room as warm as a bathhouse, but ours is colder than a changing room. ‘It’s cold outside, it’s cold inside, and it’s cold and cheerless inside me. How can you do a job properly if you have no interest in it and no wish to do it? And why is that? Because you don’t have the bare necessities of life and culture. The top brass don’t even talk about these things. Today we are faced with the fact that there is no firewood. I have to order people about. I don’t need all this. Why does it always turn out this way? My hands are stiff with cold. Why is no one looking after us commanders? What do all the brave words amount to? If we had even a hundredth of what Voroshilov promised here, on the railway, we would at least have a little hope. All the talk is of The Second Five-Year Plan, Maxim Gorky, Klim Voroshilov. The USSR has unparalleled aeroplanes, but here we don’t have even the bare minimum. Oh, hell! The only consolation is that it was even worse at the front. Some comfort! I sleep under two blankets, a leather coat and a sheepskin jacket. ‘Day greets me with a ray of sunlight on the wall, shining through a crack. I experience a moment of sheer joy, like that sunbeam, then BAM immediately crushes it and our life here falls into even starker contrast. A life of never knowing and . . . can’t come up with a name for it because everything here is just dreadful. 1 Squad have lost it, which is no surprise. They’re stuck out in the forest with none of the amenities human beings need to live, e.g., food for the soul or the mind. They’re out of touch with civilization and have food only for their stomachs, so they end up behaving like animals. Even wolves gather and play together. But us? It is forbidden for two commanders of the same educational level to serve together. What sort of policy is that? They shift you from one place to another saying you were getting too close. We have screwball superiors who couldn’t understand human psychology even if they were allowed to and just demoralize you. I’ll stick it out till autumn, and at the end of September, that’s it! Freedom or jail! I now have one idea for getting discharged - a report or speech at a meeting. I have seven months to think something up. I do want to see the Far East Region in the summer, then I’ll have savoured all the seasons. Bystrykin, a platoon commander, has TB but doesn’t want to leave. Why? Because for him this life is perfect and he gets fed. For me, it would be hip, hip, hurray!